We’re delighted to be providing marquee hire for Brighton’s Foodies Festival again this year, now part of the celebrated Brighton Fringe! 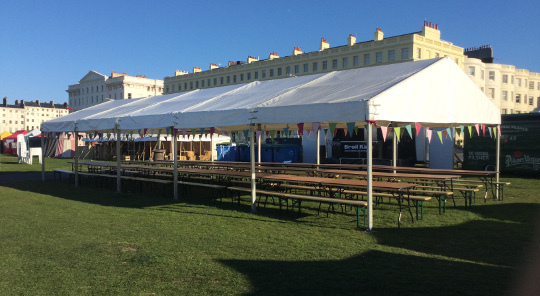 As Brighton transforms into England’s largest arts festival ready for the grand opening on 6th May, we’ll be setting up tents on Hove lawns for the equally exciting Foodies Festival. The festival runs from 30th April to the 2nd May – the UK’s Spring Bank Holiday, and features a line-up of top chefs as well of hundreds of meals, drinks and nibbles to tantalise your taste buds. This year’s event will be their biggest yet, to include thirteen marquees in all. There will be two 6m x 6m Restaurant Tents, the 9m x 18m Drinks Theatre and five Exhibitor tents with roll up walls stretching over 70m in length. Then there is the Stage and the theatre tents, the largest of which is the 9m x 18m Chefs Theatre, plus the 9m x 15m Cake & Bake Theatre and the 6m x 12m Kid’s Theatre, and marquees for extra facilities such as First Aid, the “Wash Up” and the Registration area. Accessories have also been ordered for several of the marquees including partitions, wooden flooring and carpet. Running all three days of the Bank Holiday weekend from 11am to 7pm, Foodies Festival 2016 is one not to be missed! You can even take your dog (on a lead).